This customer cannot be made inactive because it has sub customers. 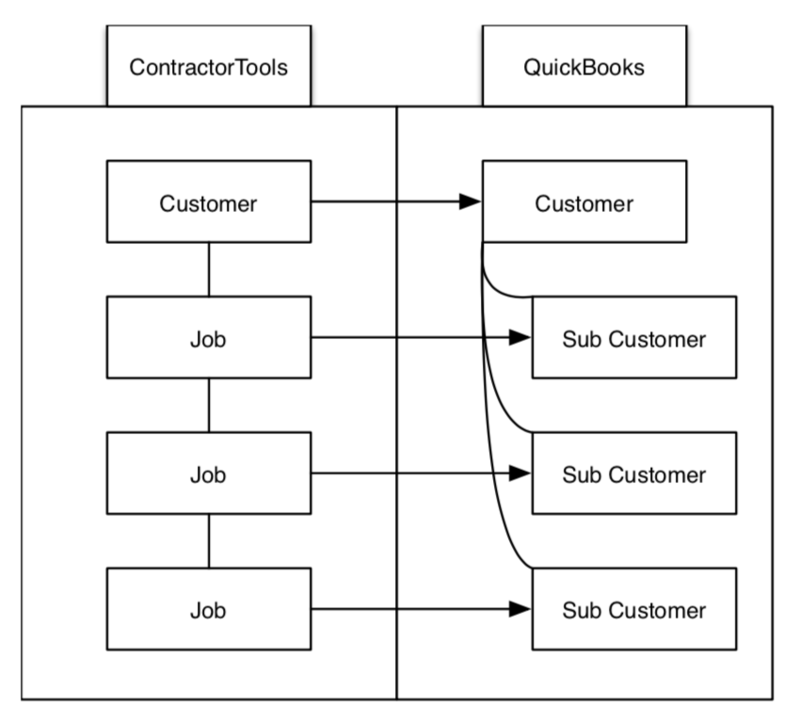 ContractorTools stores data about customers and jobs in two separate entities: "Customers" and "Jobs". This allows you to enter a Customer once, and then enter multiple jobs for that customer without having to enter the same customer information again for each job. QuickBooks does not have "Jobs", it only has "Customers". Typically, this means that you have to enter the same customer information multiple times if you want to enter multiple jobs for the same customer. A workaround for this is to enter a job as a "sub-customer" of the customer. This allows you to have multiple jobs (sub-customers) associated with the customer, and not have to enter the same customer information multiple times. QuickBooks does not allow you to delete (set inactive) customers if there are active sub customers under it. So you will get the above error if you have deleted (set inactive) a customer in ContractorTools that has jobs (sub customers) under it in QuickBooks. In ContractorTools, un-delete (make active) the customer that is identified in the error message above. Delete (set inactive) all of the jobs associated with this customer. For each of the errors (like the one above), tap on it, then tap Clear. Go back the QuickBooks Sync screen and tap "Sync Now". This should delete (set inactive) all of the jobs (sub customers) associated with the customer in QuickBooks. NOTE: If the customer in QuickBooks has any jobs (sub customers) that were not written by ContractorTools, you must go into QuickBooks and manually delete (set inactive) them in order to be able to delete (set in active) the customer. In ContractorTools, delete (make inactive) the customer that is identified in the error message above. This should delete (set inactive) the customer that is identified in the error message above in QuickBooks.